Armageddon from the makers of Card Captor Sakura! In the anime community, there are a lot of love/hate feelings about CLAMP. X, the movie adaptation of their 16+ volume manga series, illustrates perfectly why there's such division. Visually, the film is a knockout, featuring some of the most beatutiful imagery this side of Studio Ghibli. Plotwise, it's rather shallow and confusing, despite the well-defined characters and good vs evil plot. For fans of Clamp's art or of abstract animation in general, there's a lot to love in X, but for those seeking a good story or interesting characters, it's probably best to stay away. X in a nutshell... Well, the manga series isn't even finished, but the movie jumps right to the series conclusion. It is the year 1999, the year of destiny (also the year of the Eugenics war... sorry, I'm a trekkie as well as an otaku). Kamui returns to Tokyo after a 6 year absence and finds himself an integral part of the battle between the Seven Dragons of Heaven and the Seven Dragons of Earth (The Seven Seals and Seven Minions in the manga). The Dragons of Heaven want to save humanity, while the Dragons of Earth want to wipe humanity out and start the world over. The Heaven faction first tries to enlist Kamui, but he's not interested in their war- just in saving his childhood friends Kotori and Fuuma. When Kotori is kidnapped by the Earth faction, he finally does team up with the Dragons of Heaven. But because this is a world ruled by fate and balancing power, Fuuma gets drawn to the other side and becomes Kamui's nemesis. In a series of bloody battles, nearly every character from the manga is killed, leading up to the final (very quick) battle. The animation is stunning - Madhouse studio's best work up until Vampire Hunter D: Bloodlust. With lots of dream sequences and supernatural battles, X takes advantage of the animation medium like few films do. Blood: The Last Vampire might have more "advanced" animation technology, but there is nothing in that film that required the animation medium. Because of the scope and imagination of X, there's really no other way it could have been made. X's score is hauntingly beautiful, one of the best I've ever heard in anime. It suits the mood perfectly. Sound in general is very well done, very important with so much destruction on screen. While normally I like to give a dub track a chance when watching anime, this is one film where I switched back to subtitles right away. Manga's done some wonderful dubs with Macross Plus, Cagliostro, and Honneamise, but the X dub is atrocious. The voices are way overacted for the somber, fatalistic tone. For technophiles, giving up the dub track also means losing the rich 5.1 surround sound- sad, but necessary. With so many characters appearing and dying in so quick a time, it's very hard to keep up with who's who. Fortunately, Manga does us a huge favor on the DVD by providing wonderful character bios in the form of Tarot Cards. This extra is well thought out and well executed, and is recommended reading before watching the film for anyone unfamiliar with the manga. To provide insights into the making of the film, Manga also includes a 24 page interview with director Rintaro, detailing his involvement with this and other projects. While a video interview would have been better, the text interview is still quite interesting. While Manga's presentation of the content on the disc is excellent, they completely dropped the ball on packaging. 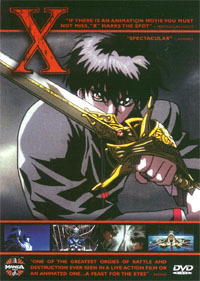 X is one of the most beautiful anime movies ever, so why are we stuck with a grainy, drab screenshot as the cover art? I guess they felt they had to get a guy with a sword on the cover to attract teenage guys. What a wasted opportunity for a graphic designer. Still, you can't judge a DVD by it's cover.